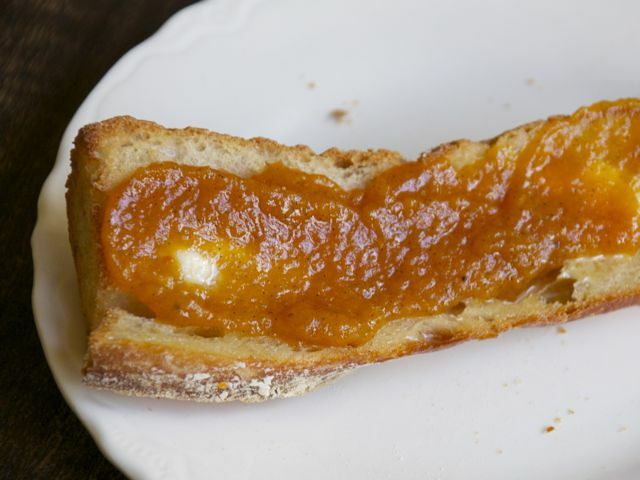 I like to serve this spiced butter on wheat or rye toast topped with thin slices of Gruyère, or as a layer spread underneath the fruit in an apple galette. Fuyu persimmons are more widely available than the bitter-until-squishy-ripe Hachiyas. This recipe makes a great gift, so you may want to increase the recipe and process it to make it shelf-stable. Put the persimmon pulp into a large, wide, heavy-bottomed pot. (Enameled cast iron works well.) The wider the pot, the shorter the cooking time. Also, the taller the better, as the pulp will splatter. Slice the vanilla bean up one side lengthwise, open it up, and scrape the tiny seeds into the pot with the pulp. Add the vanilla-bean hull to the pot. Add the sugar, maple syrup, cardamom, and cinnamon. Set the pot over medium-low heat and bring to a simmer, stirring to dissolve the sugar. Adjust the heat so the pulp is just barely bubbling and cook, stirring occasionally and checking often to avoid burning and sticking, until the pulp thickens and begins to turn dark, about 1 hour. Add the rum and cook for another 10 minutes. Add the lime zest and turn off the heat. Let cool, remove the cinnamon stick, transfer to a jar, and refrigerate. The butter will keep for up to two weeks in a covered jar in the refrigerator.